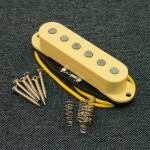 The Ironstone Strat pickup family shares the warm, bright vintage tones as the Stratocaster sound clips demonstrate. 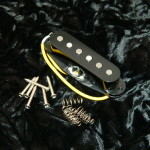 These are mainly derived from the use of Alnico V pole pieces. Yet each style has its own individual character blended with that base. 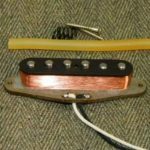 This is driven by the level of copper windings (and thus resistance) of the individual pickups, and the overall make up of each set. Origin, Silver, Gold, Platinum & Hybrid. 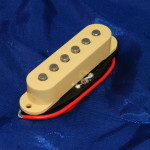 Ironstone are happy to include good quality customer's Stratocaster sound clips - please just get in touch through the Contact Us page. 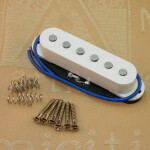 While there is no substitute for hearing the tone of Guitar pickups 'live', thanks to David Osborne for these clips giving an instant A / B tone comparison of a stock 1987 MIK (Made In Korea) Ceramic pickup Squier before and after fitting sets of Ironstone Silvers and Platinums. You will need to crank up those PC speakers and woofer of course, or play these through your normal guitar rig for the clearest comparison. From the warmth of the Ironstone Bridges, compared to the thinner sounding Squier, to the added depth of the Ironstone Necks, the clarity and Vintage tone enhancement of the Ironstone pickups is evident.